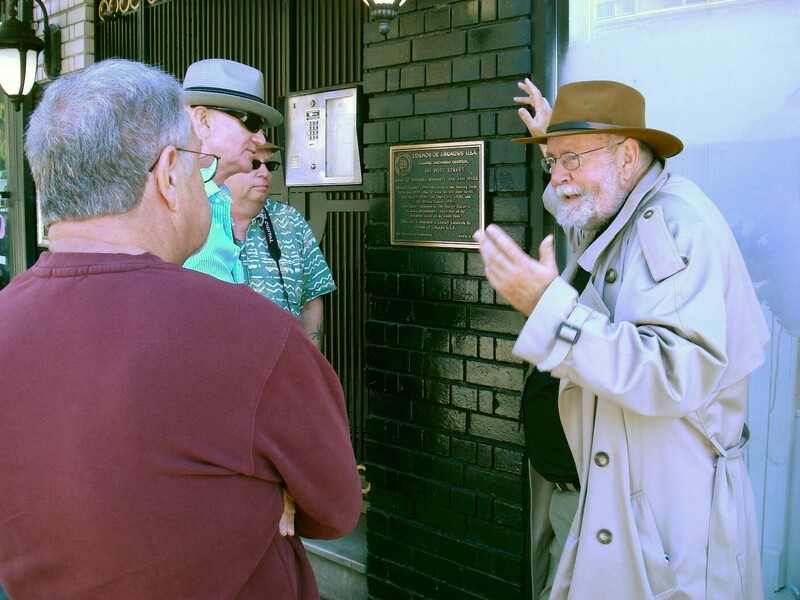 Image above — gesticulating next to the plaque marking the Sam Spade apartment building in 891 Post Street. And if you want to gumshoe the mean streets on The Dashiell Hammett Tour this month, your chance to do so occurs on Sunday September 21. Starts at noon, near the “L” sculpture. Lasts 4 hours, maybe even 4 hours and 20 minutes, depending on how many questions get tossed about. No reservations. If you want to go, be there by noon with the loot and plenty of rosin for your footwear. This entry was posted in Tour and tagged 891 Post, literary landmarks, Literary Plaques. Bookmark the permalink.